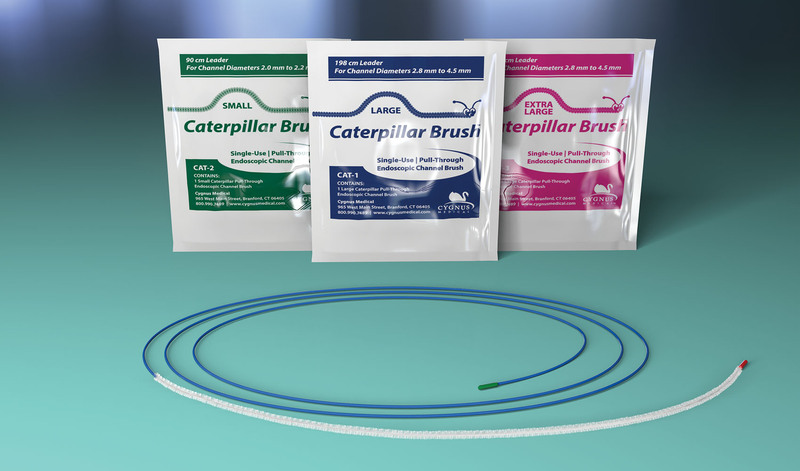 The Caterpillar Brush is the first endoscopic channel brush designed to be pulled through the biopsy and suction channels. This pull-through design eliminates the buckling that normally occurs from pushing a brush through a channel. There are over 80,000 bristles on the Caterpillar Brush compared to other brushes that have around 600 bristles. This increases the efficacy and efficiency of each pass. 80,000 bristles allow for the removal of more bioburden in the channels. Caterpillar’s pull-through design eliminates the buckling that normally occurs when pushing a brush through a channel. Single-use brushes eliminate the need for cleaning the brush after use, and reducing the risk of cross-contamination. Available in a range of brush and leader sizes designed to meet a variety of needs. Single-Use and latex-free. 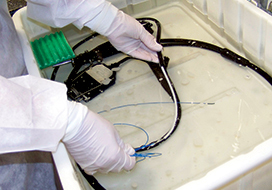 Immediately following the procedure, the endoscope should be manually cleaned at the patient’s bedside, and then transported to the decontamination room. Air leak test the scope according to the manufacturer’s recommendations. 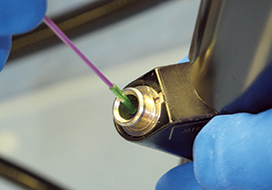 During the entire cleaning process, the endoscope should be completely submerged in a detergent solution to prevent any splashing of contaminated fluid and aerosolization of bioburden. While submerged, wash all debris from the exterior of the scope. and suction ports of the scope.­­­­ Flush all channels with clean water and thoroughly rinse all detergent from the scope. 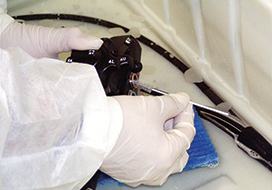 Prepare the scope for high-level disinfection.